Boeuf à la Bourguignonne, Beef Bourguignon, beef burgundy, or just beef in wine sauce. For me, few dishes invoke thoughts of cool weather, friends and hearty meals like beef Bourguignon. Many credit Julia Child with bringing this dish to the forefront. As a result, Americans often envision this dish when they think of French cuisine. Several years ago, Jill and I had the opportunity to travel to France. Beginning in Paris, then on to Champagne, we further travelled South to Burgundy. 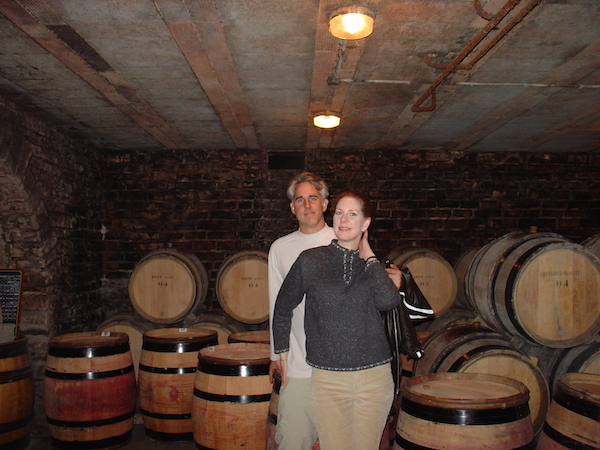 We visited several chateaus and wineries in the famous region. Burgundy wines are highly regarded in the world of wine. With well known regions such as Chablis, Nuits-Saint-Georges, Côte de Beaune, Côte Chalonnaise, Mâconnais, and Beaujolais, the wines are very high quality and can be quite expensive. It is not unusual for some Burgundies to sell for hundreds of dollars per bottle. The primary red grape of Burgundy is the very well respected and not very forgiving Pinot Noir. One night, after a tough day of site seeing and winery hopping, we went to a Burgundian restaurant which was well known for their Boeuf à la Bourguignonne. It didn’t disappoint! Rich wine sauce, well seasoned, tender beef, and tasty vegetables. They served it in it’s own crock with a lid, very old school and very awesome. While I have made Beef Bourguignon using Pinot Noir (usually from California), I also like to experiment and use other red wines as well. The only basic rule of thumb is to use a wine which you would enjoy drinking. Northern California has tons of good wines, but one of my favorites is Zinfandel. In my opinion, it lends itself well to this dish. I also like to try and pair the same wine I use in making the meal to go along with it. Below is my version of this classic stew. There are a multitude of ways to put this together and I have seen several and I enjoy them all. For mine, I do not use any stock, water or demi-glace, as I like to rely solely on the wine in combination with the beef for the rich sauce. Salt and Pepper as always! Cut the beef into largish chunks. Maybe 2" square. Season the beef with salt and fresh cracked pepper. Heat your oil and 2 tablespoons of the butter on medium heat in a large pot or dutch oven. Add your seasoned meat and brown. Be carful not to over crowd the meat or it will be difficult to brown. If necessary, brown the meat in 2 batches. Once the meat is browned, add your chopped onion and garlic. Continue cooking for about 3 minutes until onion is soft and translucent. At this point, add your entire bottle of wine. Then stir in your flour and add your bay leaves. Bring the mixture to a simmer, reduce heat to low, put on the lid and simmer for 90 minutes. Meanwhile, in a separate sauté pan, add the remaining tablespoon of butter, 1/4 cup of water, and your carrots, onions, and mushrooms. Salt and pepper the veggies. Cook on medium low heat with the lid on for 5 minutes. Then remove the lid and continue to cook while stirring for another 5 minutes (as the pan dries out, the veggies should brown a little). Remove vegetables from heat. Make sure to season the soup with salt and fresh pepper. Scoop ladles of beef and broth in warm bowls and then place some veggies and a sprinkling of parsley on top. Enjoy!